I picked up an old Disston No. 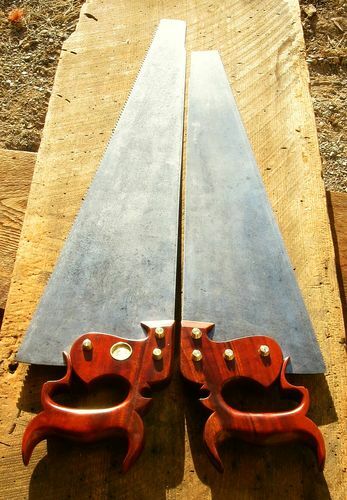 9 rip saw with a 30” blade at an auction last summer. 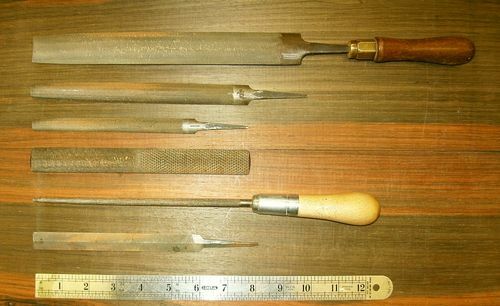 The faint etch and size and position of the screw holes date the saw to 1871 – 1876. However, it had a crude user-made handle that needed to be replaced. By coincidence, a 30” Disston No. 9 showed up on eBay recently. 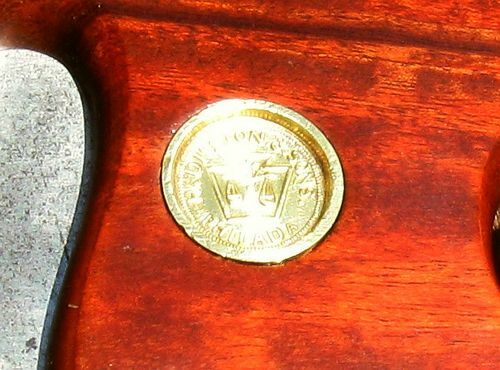 The maker’s stamp on that saw dates it to the late 1840s – early 1850s, but the most interesting part about the saw was the handle. It’s a very stylish handle, but not the normal 3-lobed handhole handle that came on a No. 9. Additionally, the handle is attached with domed saw screws, aka cone nuts, that Disston used for a brief period in the 1870s. 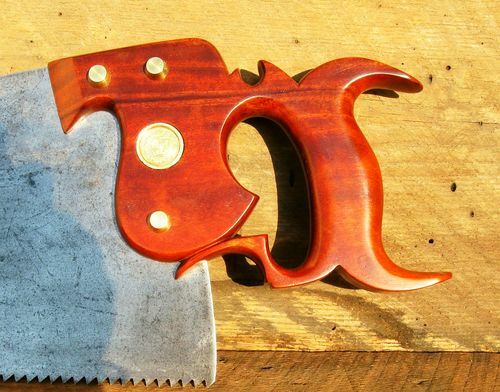 I don’t know if the saw was a special edition by Disston, or if the handle has been replaced at some point. 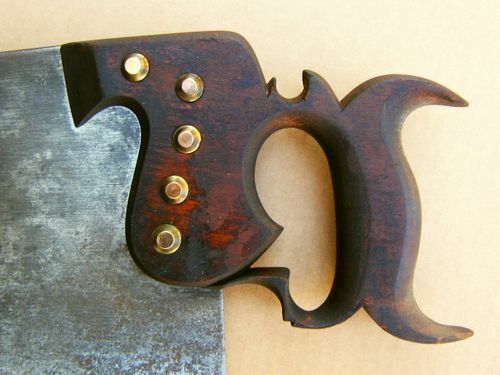 The saw sold on eBay for $777.57, so collectors obviously felt it was a valuable saw. I like the design of this handle, and the domed screws fit the same time period as my saw. It’s an added bonus that the saw this handle is on is quite valuable. 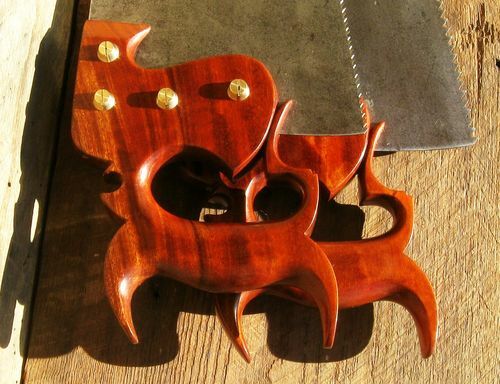 I decided to use this handle as a pattern for my saw. The next decision was what wood to use. My saw probably had an apple handle when it was new. I didn’t have a piece of apple big enough for the handle, so I selected a piece of nearly vertical grain Jatoba with a few dark streaks and just a hint of ribbon figure. I printed a picture of the pattern handle, sized it to scale, and taped it to the Jatoba. Tracing around the image with a pencil gave me a line to start cutting to. Some people glue the paper template to the wood, but this way I can use it again on future handles if needed. Using bandsaw, scroll saw, disk sander, spindle sander, and rasps, I cut out the profile of the handle to exactly match the pattern. 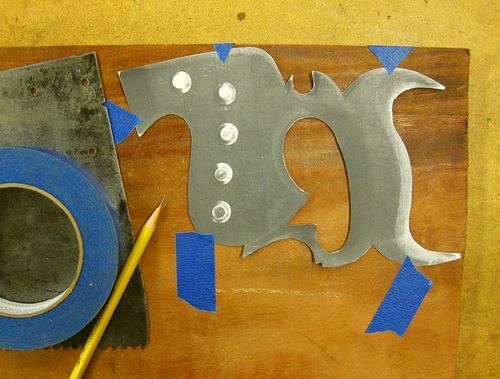 If you don’t have all these tools, you can do the same thing with a coping saw and rasp – it just takes longer. The next step is marking the handle for blade and screw hole position. I lay the blade on top of the handle, position it where I want it, and using a pencil, I make a small mark at the top and bottom of the handle where the slot for the new blade should stop. I mark the screw holes at the same time. Next you can either drill the holes for the screws, or saw the slot for the blade. In this example I drilled the screw holes first. After marking the center of the holes with an awl, I drilled a 1/16” pilot hole. This small hole locates the screw position accurately on both sides of the handle. When using split nut screws, I then use a forstner bit of the appropriate size to inlet each side to the correct depth for the screw head and nut. The pilot hole keeps the spur on the forstner bit centered. Since this saw will have domed screws, I only needed to do that for the medallion, which is 1” in diameter. The final step is drilling through the pilot holes with a bit the size of the screw shanks. Sawing the slot for the blade can be done a few different ways, but this is my way. 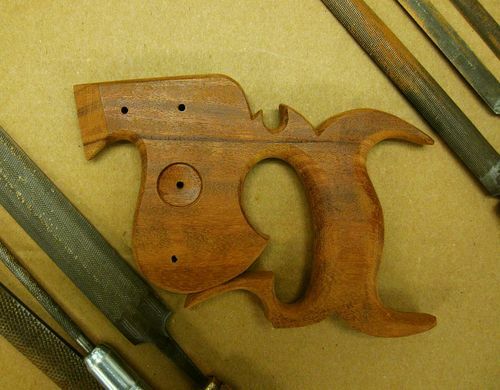 I simply tighten the handle in the vise, mark a center line on the edge, and saw the kerf freehand. 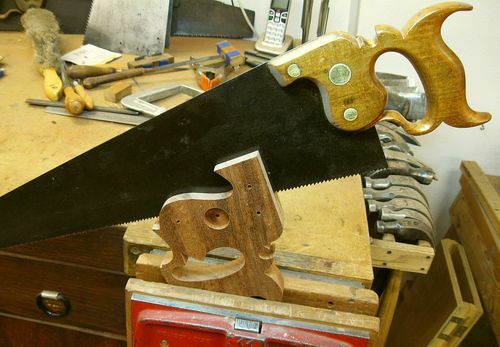 My favorite saw for this is an old Wheatman and Smith panel saw. I take it slow, frequently inspecting to ensure I stay on the centerline. The old W & S has never let me down using this method. 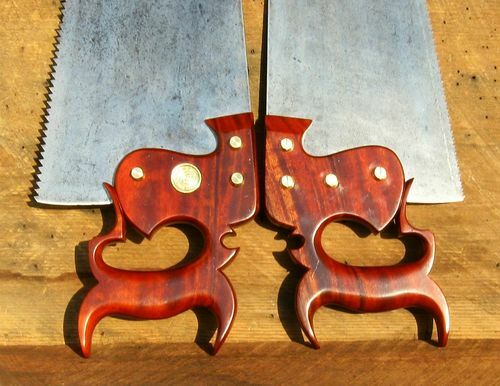 Depending on how thick the saw blade is, I may have to chase the cut with a different saw with a little more set. At this point it’s time to start shaping the contours of the handle. Some people begin the process by using a round-over bit in a router. I find it just as easy and nearly as quick to use rasps from start to finish. I feel the rasps give me better control in making sure I don’t remove wood that I shouldn’t. 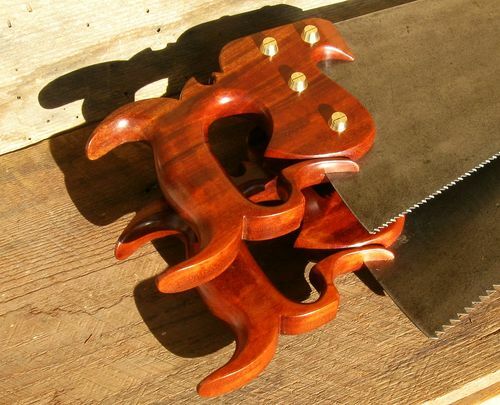 A curved handle-maker’s rasp would probably be beneficial for this task, but I don’t have one. My “go to” rasps are all straight, but they get the job done. To start the lamb’s tongue, I use a regular triangular saw file to make a groove between the notch in the handhole and the juncture of the cheek and tip of the lamb’s tongue. Note the piece of white cardboard in the picture below. I insert this in the saw slot whenever clamping the handle with a c-clamp or in the vise. This prevents possible breaking of the handle if the slot is compressed too much. Shaping the handle is a little bit like sculpting. It takes a good eye, feel, and practice. My tendency is to be conservative and not take off enough. 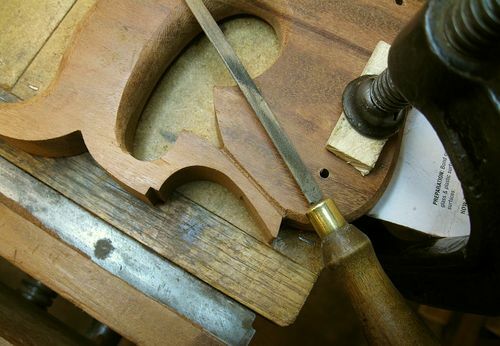 I constantly inspect and rotate the handle in the vise, removing a little here and a little there until smooth contours are formed that are pleasing to the eye and hand. Here is the handle after rough shaping with the rasps is complete. I finish the shaping of the handle by going over it with files to remove the rasp marks. Then I sand it with 220 grit sandpaper followed by 320 grit. I make my own saw screws, and since I don’t have a metal lathe, it’s a tedious process. 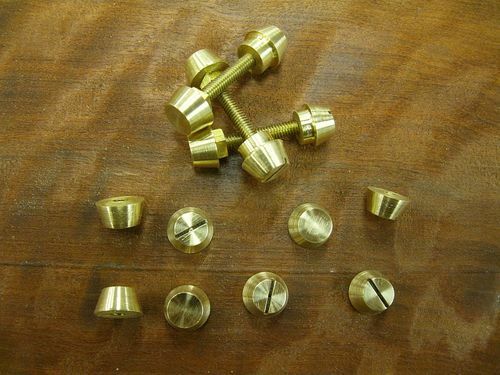 I begin with ½” brass rod and 8-32 brass threaded rod and use a method similar to this. I differ from that method by not drilling all the way through the head of the screw and by using a filed-down 8-32 brass hex nut to form a square shoulder under the head to prevent the screw from turning in the handle. The head, shoulder, and shaft are then soldered together, making a strong screw. The process for making split nut screws and domed screws is pretty much the same. This is a batch of domed screws and nuts I made by hand, some of which will go on this saw. 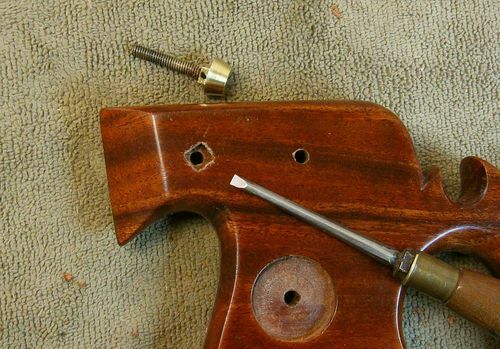 The square shoulder on each screw has to be hand inlet into the handle. This should be done before the finish is applied, but on this saw I got overly anxious to see what the wood looked like with a finish on it. Since the screws are hand made, each is a little bit different. Each screw has it’s own hole, and it only goes in the hole one way. 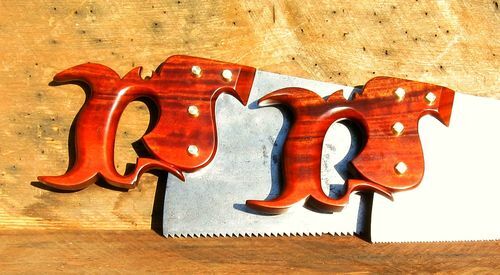 For a finish on saw handles I prefer several coats of satin wipe-on polyurethane followed by light buffing with 0000 steel wool and then a coat of paste wax. 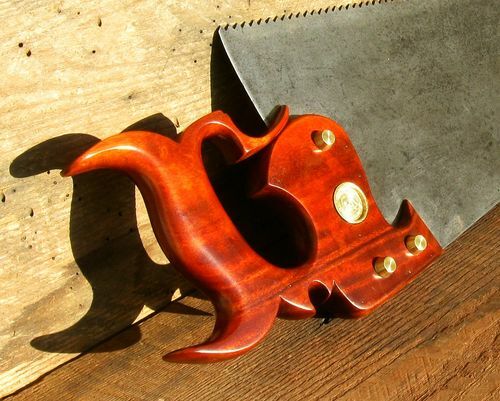 Here is the finished handle mounted on the saw blade. 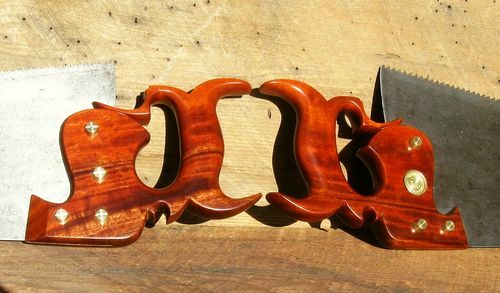 The color is the natural wood with no stain or dye applied. I’m pleased with how the saw turned out, but that’s not the end of the story. 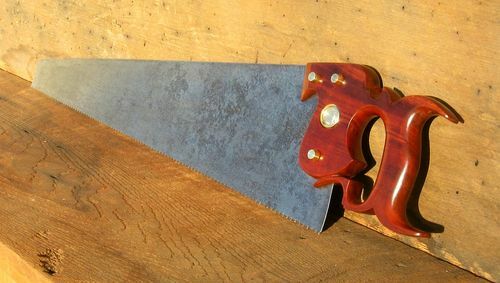 Last summer I picked up another saw at a yard sale. That one was a 28” rip saw with no handle. There was no visible etch on the saw, so I’m not sure who made it. 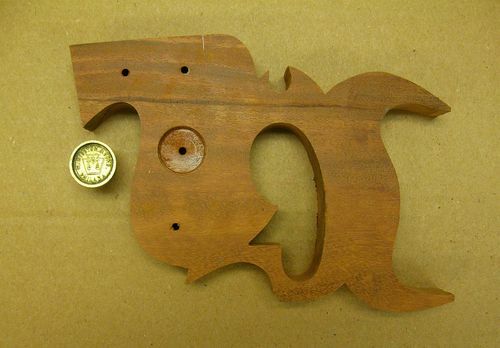 It’s an old saw with good steel, and the shape of the heel and toe and screw placement are almost identical to the No. 9. 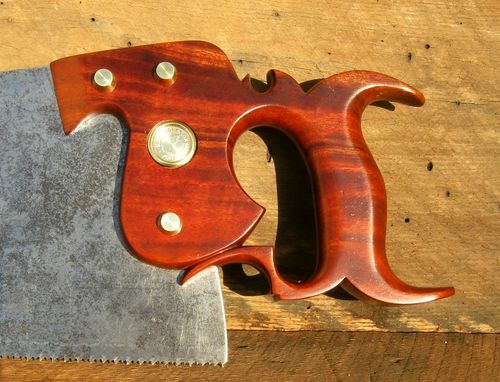 There is no “X” under the handle like Disston put on their premium saws, and like my No. 9 has, so the maker and model will remain a mystery. I thought it would make a nice companion saw for my No. 9, though, so I shortened it to 26” and retoothed it to 9 ppi crosscut. I then made a matching handle out of the same piece of Jatoba. 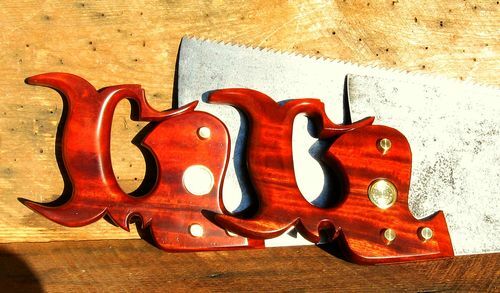 The two saws together make a nice matching pair. 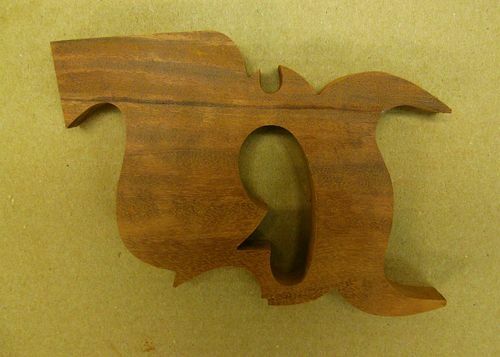 Here is a picture of the second handle. 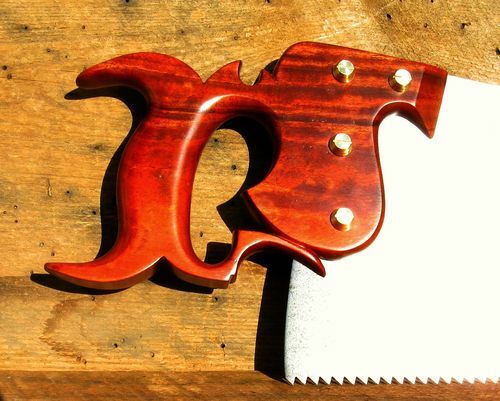 I’ll close with several pictures of the completed saws. Thanks for following along.